(CHRIS) Matt made me get up at 8 a.m. For some reason, only HIS side of the tent was wet, Hmmm. (Matt there are people you can talk to about these problems. Call 1-800-BED-WETT.) 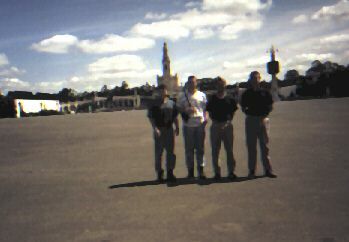 Anyway, we had alot to see in Fatima. So we drove to the basilica and parked. 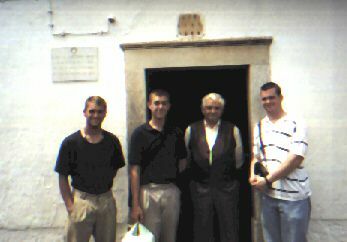 Matt, Sam, and Jon heard Mass at the chapellina whose altar is on the spot of the apparitions. The exact spot is marked by a statue of Mary, surprisingly small. In fact, this whole chapel is surprisingly small. It has three glass walls, with the back open. There is seating for perhaps 100 and no decorations. I am not sure why this is separate from the basilica. Jon and I were wondering why the basilica is not on the apparition spot, Instead, the chapellina is in the huge court in front of the basilica. The basilica was quite big and very nice. I liked all of it but the semi-modern-art stain glass. We saw Francisco's and Jacinta's graves on the side altars. I saw an old Portuguese lady openly weeping at Jacinta's grave. Next to Jacinta's tomb was a spot reserved for Lucy. Outside, near the chapellina, many candles burned, like at Lourdes. However, much of the melted wax is shaped into various wax body parts at pilgrims' requests to pray for different cures. We saw some wax feet and a heart. 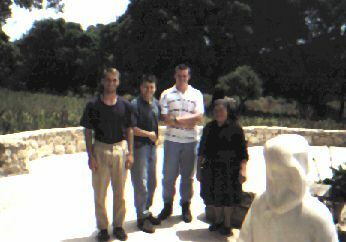 At the far end of the paved court, we met a lady who had just returned to Fatima after many years away. Her family runs a local hotel, but she had left for the big city life, Toronto. Then she began to miss little Fatima, and now she works for her parents. She pointed out some places we should not miss. Oh--before that we ate lunch that we bought at a local market. Bread, apricot spread, oranges, Fatima water, potato sticks. It was good. Also, Jon called a local convent where his mom knew some people. They agreed to put us up for the night and give us dinner. We would meet them at 3:30. So we had three hours to see the other sights. (MATT) We walked to the hill where the angel first appeared to the children; they left the actual rock upon which the angel stood. The statue of the angel was placed upon the very rock. There were the fourteen plus one stations on the way to the top of the hill. Most of the noses of the Romans in the stations had had their noses hammered off, apparently by local children (according to Father Fox) who related the Romans to the Communist regime which was trying to take over. I personally think that it was teenagers. At the top of the hill after the stations was the Hungarian chapel. On top of the chapel was the crucifixion scene with an extremely muscular Christ. The view from the top of the chapel was very nice. Then we stopped at some shops: I bought a pretty wool hand-made sweater for Liz and five rosaries for some friends. Then we saw Lucia's house and Francisco's and Jacinta's house. At the latter's house, we spoke to their nephew. (Manuel was their brother and we spoke to Manuel's son.) He showed us the house and was very friendly. Their mother (F&J's) had nine children in the tiniest little room. The nephew showed us all that was original and all that was replica. He was pretty old (65?). Next we went to the well and a little old lady gave us a drink. Sam told me to give her some money but she wouldn't accept. Hope she wasn't offended... Thanks alot Sam. 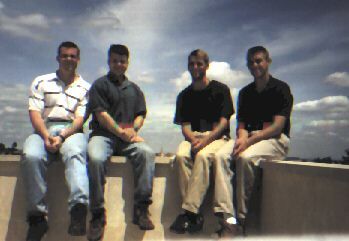 After these adventures, we walked back to the Cova, Jon and Sam washed themselves (Jon shaved too) so that we'd look presentable before we met the nun we would try to con into putting us up for the night. Then off to the convent. We met Sister Mary Helena and talked to her for a little while. She was concerned that we were going to get ripped off in Spain and Italy. So she called down some guy to tell is how to avoid such a calamity. We talked a little while and eventually started talking about Fatima (of course.) He was very impressed with their faith which was, according to him, far deeper than that of Americans--that their faith was very, very great and simple. We did not take offense because our humility recognizes our own lack and he was from California, so what could we say. He also said that he saw many similarities between California and Portugal, being that they were both agricultural and were on the ocean. This I didn't agree with. I pointed out that California had soil and Portugal did not and that the wealth of an area is usually related to the soil, especially in an agricultural society. Portugal has to dynamite the ground in order to farm it. They blow up the rock to turn it into soil so that they can grow stuff in it. Anyway, Sister took us up to the convent and showed us our rooms. We relaxed, cleaned up, napped, and waited for dinner. Finally dinner was served. We entered our own dining room to find bread and wine on the table. Moments later a nun appeared with a giant bowl of soup (noodle and egg). Before we had even begun, another nun appeared with a huge plate of potatoes and fish. We ate and ate and ate and then kept eating. The food was excellent and we felt it would be rude if we didn't finish. We thought that they might have just brought us their food first and would come in to take the rest to the other nuns, but we decided it was all for us. After dinner, all the nuns came in with a huge chocolate mousse pie and sang Happy Birthday in Portuguese. Just kidding. After dinner, really, Sister Mary Helena and a priest (who had just come in from Brazil) visited for awhile. It was very pleasant to speak English to someone new. 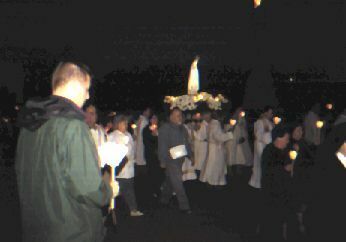 That evening we went to the Cova for the rosary and a candlelight procession. It wasn't huge, but it was nice. Then Sam pressured us into doing that penance walk. It wasn't a walk, in fact I have no idea why they call it that. It was more like the penance moving rosary on your knees for a mile. As I was finishing, two Spanish ladies came up and asked me if I was Portuguese (Ha) then wanted to know if the kneel was muy difficult. I told them no not difficult but not easy. We went home and slept like babies.